Below is how we designed our journey for the climb of 19 September 2010. It serves as a guide for you to design your own journey. We have a very tight schedule, i.e. reaching Kinabalu National Park Head Quarter (KNPHQ) on 17/9, went up to Laban Rata on 18/9, reached summit, returned back to Kinabalu National Park Head Quarter (KPHQ) and departing Sabah on 19/9. Eight of us flied from LCCT (Low Cost Carrier Terminal), KLIA, To Kota Kinabalu with Air Asia. We came one day earlier so that we can walked around Kota Kinabalu. We stayed in KK's Cititel Express. 3.00pm: The van from our travel agent picked us up to Kinabalu National Park Head Quarter (KNP HQ), where we spent a night. 6.00pm: We had buffet dinner at Balsam Cafeteria in KNP HQ. The food is good with satay and BBQ. 9.15 am: We started our way up from Timpohon Gate. 3.30 pm: I reached Laban Rata. 5.00 pm: We had our buffet dinner at cafeteria. 6.00 pm: We went to sleep. At LCCT, before boarding. I was holding the camera. We flied with AirAsia, off course. 7.30 am: I reached the peak (I was having some altitude sickness problem right before and after Sayat Sayat checkpoint) as the last person reaching the peak for the day. 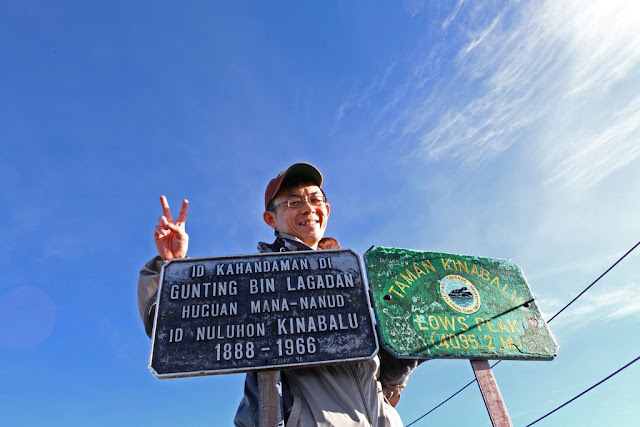 Lows Peak, Mt Kinabalu (4095.2meter). Yes, I made it to the top of the summit. 11.30 am: We left Laban Rata in heavy rain. 6.00 pm: Finally reached Kinabalu National Park's HQ and rushed to airport (which is about 2 hours away) as our flight back to KLIA, West Malaysia, would be departed on 9.30pm. We did not have time to waste. We needed to check-in an hour earlier as we were having trouble in web check-in at Kinabalu National Park's Headquarter. 9.30 pm: Finally we managed to catch the 9.30pm Air Asia flight back to West Malaysia. By the way, I really like to eat in the plane. In total, I was active for more than 24 hours since waking up in Laban Rata for the summit assault. The only time that I rested was probably in the van and in the Air Asia plane.